← Check out my Home Shopping Video!!! Maddy received her box o’ Xmas/Valentine’s Day goodies, so I can share with you the surprise prezzie I popped in for her! 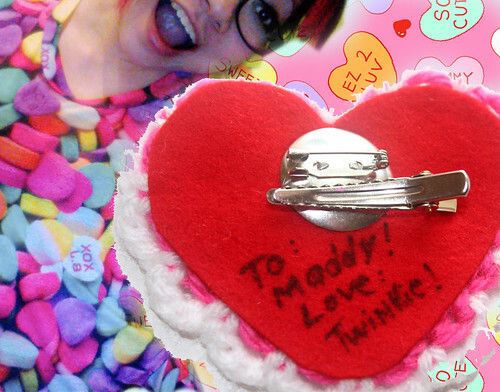 It’s a super cutesy wutesy Valetine brooch and hair clip. It has a ton of heart-shaped and regular shaped beads and cabs all over it. I will definitely offer these before next Valentine’s Day, and maybe even just soon/whenever, cuz I think they are a sweet little way to say I HEART YOU!!! A few days ago, I got my hurrr cut by Jules. We were trying to figure out how long it had been since I’d gotten it cut, but it was definitely time, and my head feels so much less bulky and shaggy! We didn’t change anything major, but I think I will probably want my bob back in the summer! She also said she would pretend not to notice the giant chunk of bangs I had cut out of my head on my own. DOH. Today we drove to Sacramento with the doggies to visit Hairy’s family and his new baby niece. I didn’t take pictures, though, cuz I’m sensitive about posting pics of other families on my blog. I did snap a pic of the cardi I wore, though. I clearly can’t let go of the Valentine’s Day spirit! It’s from Forever 21. Hearts hearts hearts!!! Just a note: this doesn’t mean I will start posting patterns for everything under the sun!!! I think for now, I only intend to post the occasional pattern for projects I know I probably don’t want to sell finished products of myself. For stuff like the cupcake coffee cup cozies: I’m still making them and selling them, so I probably wouldn’t post the pattern just yet. I’ve already been fielding a few questions like these, so I thought I would just bring it up! 🙂 But I WILL be sharing a VERY cute coffee cup cozy pattern with you guys via a SUPER rad magazine that I adore. I will let you know when that is out! The awesome girl who cuts my hair is also kind enough not to give me hell over my self-cut hair. And I always promise that I won’t do it again. And then I always do. Cutting your own hair is just too much fun! 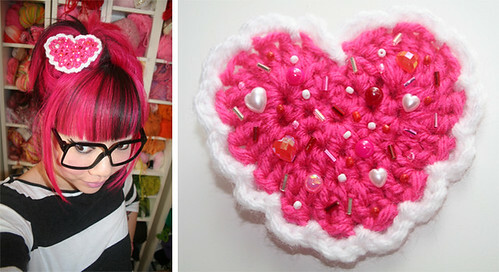 Love all the cute heart things!!!!! Totally understand about not putting all your great patterns for sale, I mean they are yours after all! 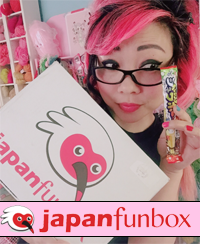 A give away with prizes??? Hot dam!!!! omg cute!!!!!! I’ve been adoring your four chain “lace” trim on your peices lately, love!!! I want to go buy crochet thread and do it to the sleeves of my cardi’s now. Love your top!! I heart Forever 21!! The heart pin is darling too! Love all your fun creations! You are so talented and have such a fun & unique style!! I've been thinking of publishing a book of my own poems since going thru my storage stuff a while back…i realized i have like 20 journals full of poetry from since i was about 12 years old…so 15 years. ANyway it made me think of you cuz i noticed you mentioned your success in the publishing industry. any advice for this aspiring author? 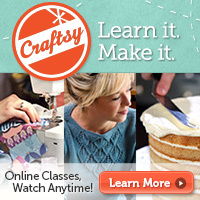 Cant wait to find out about the cup cozy in your fave magazine!! I adore your cupcake coffee cozies — soo cute!! 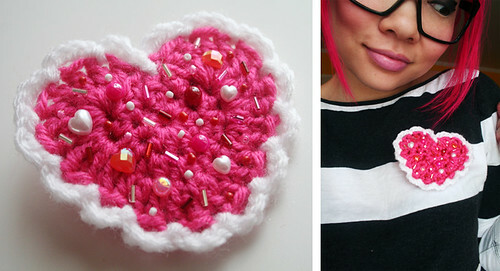 That is such a cute heart brooch! I like how it is multi-functional. Also, i got my icecream hair clip last night and it’s soooooooooooo amazing, your perfect stitches are worth every cent (and this is coming from a gals whos mom is never seen without a hook and yarn). oh oh!! and i was just gushing to my husband when i noticed that you were wearing the orange polka dot dress i made in your business card.love!!!!!!!!!!!!! !